Aquaclio Superior RO System 1. Aquaclio Counter-current Filtration Technology (CFT). 2. Aquaclio Patented Advanced Technology RO Membrane –Extended Service Life with Modern Structure & Membrane Module Capable of Producing the Daily Range of 200 ~ 300 L. 3. 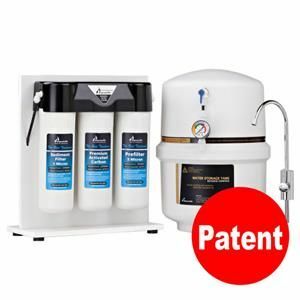 Removes Sand, Silt, Dirt, Rust Particles, Chlorine Taste, Odor, Cysts, Arsenic, Barium, Cadmium, Chromium, Copper, Fluoride, Lead, Radium, Selenium, Turbidity, Total Dissolved Solids (TDS).... 4. Water Production & System Production - Automatic. 5. Easy to locate under the Sink. 6. John Guest Tubing – Durable. 7. Aquaclio Quick-Twist Filter Design – Easy to Replace.